I was out wandering the woods on a May afternoon. It started to rain, and I was soon quite soaked. I love to be out when the rain falls on these spring days. The rain is cool and refreshing, and when the temperature is warm, like it is in May, it like giving the land a nice, cool bath. I followed the old gas well road as it descends down a steep hill and then flows out into what we in the Allegheny Plateau call a “bench.” Benches are areas of relatively flat land that suddenly jut out from the steep hillsides. A bench is easy walking and a good place to search for game. As I approached the bench, I came upon a stand of ferns, and just beyond the ferns stood something. It was a deep reddish color but shaped unlike any plant or animal I was accustomed to seeing. The shape revealed itself to be an animal when part of it moved, but my mind couldn’t register exactly what it was. 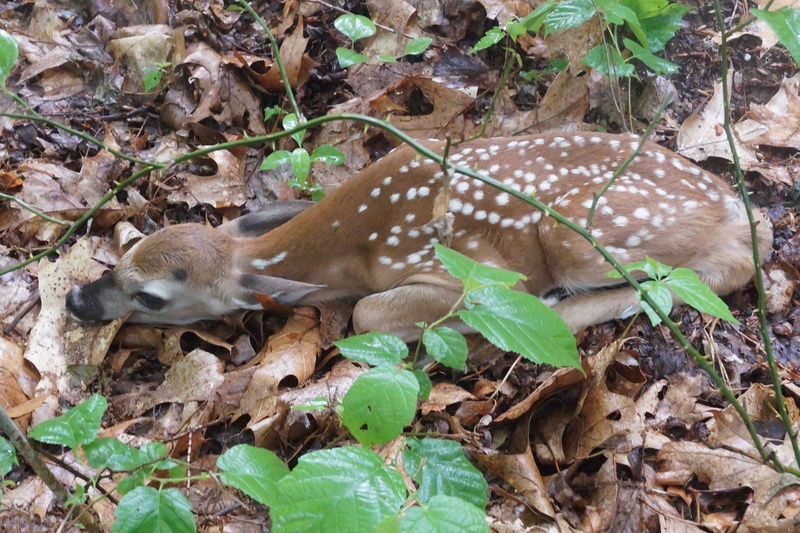 It suddenly dawned upon me that I had come across the first white-tail fawn of the season! It was about the size of a Yorkshire terrier, though with much longer legs, and I knew that I had to get a photo of it. But as I approached, it realized I wasn’t its mother, and it trotted off into the undergrowth. As its instinct demanded, it dropped flat against the forest floor. It is this instinct that has kept white-tailed deer fawns alive through the millions of years that their kind has lived on this continent. The white dapples on the back actually break up its shape against the forest floor, especially if the sun is leaking down through the leaves. However, it really doesn’t work when a person sees it drop down. Because its instinct is not to run once it drops down, I was able to approach and get some nice close-ups. To be able look upon a creature this little, this new, and this wild is truly a privilege. White-tailed deer are quite elegant animals. They are such common creatures that most of us just ignore them until they eat our vegetables or run in front of our vehicles. There are very few species of large game that are as adaptable as white-tailed deer. In North America, they do well because of human interference into the ecosystem, not in spite of it. We’ve reduced their predators to relict numbers, and in the East, we’ve killed off all the bison and wapiti (“elk) that would have out-competed them for browse. 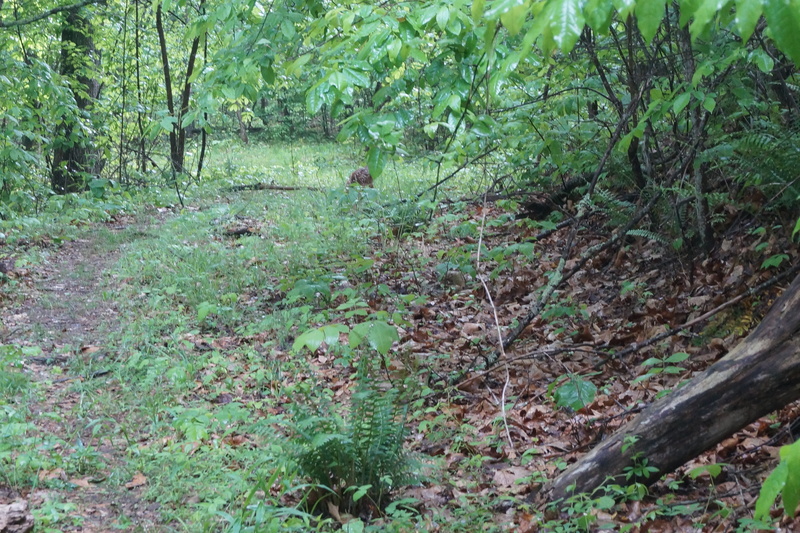 This dappled fawn would not be without the risk of predators though. In these woods, there are coyotes, bobcats, and black bears that wouldn’t mind a bit of tender venison on a warm spring day. I hope this little fawn made it. If only it could have dropped down tighter in the thicker cover, I wouldn’t have been able to see it. 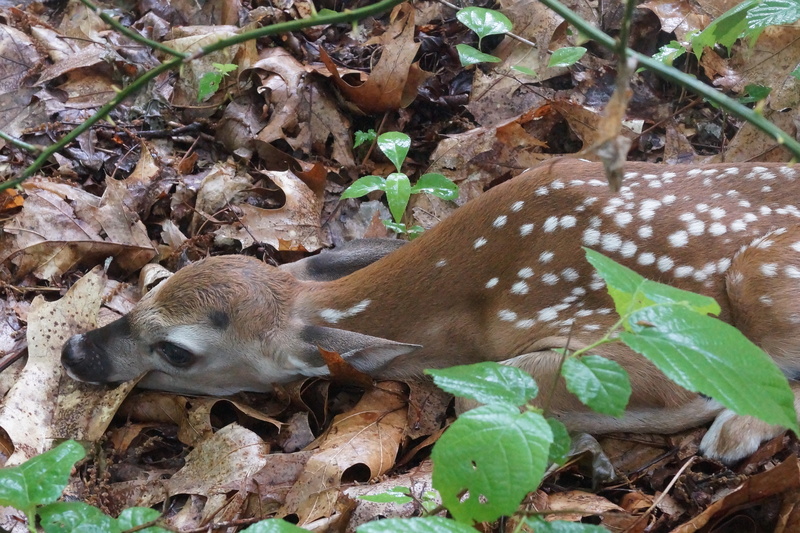 The hope for little deer is the stillness by which they lie down against the forest floor and how well their camouflage and lack of scent hide them from wandering predators. They are born as prey and live their lives as prey and usually die as prey. It is a harrowing existence, but it begins so innocently, with the dappled ones lying close to the leaf litter, hidden away from prying eyes and quivering nostrils. Hide and you will survive long enough until you have to bound and leap to survive. Live long enough for the rut and survive the winter, and your genes will in the next generation of dappled ones. And that is how your kind has lived here all these millions of years. It has been an existence of fear and trepidation and constant danger. But in our stupidity, we’ve made the world a better place for them. Some predators will get a few, but in most of their range, they are no longer harried by wolves or stalked by cougars at all hours of the day and night. But the fear that forged their kind is still there, and if they are to thrive the new world of coyotes and resurgent black bears, they will rely upon that fear to keep them going. Let’s hope that the deer will always be afraid.